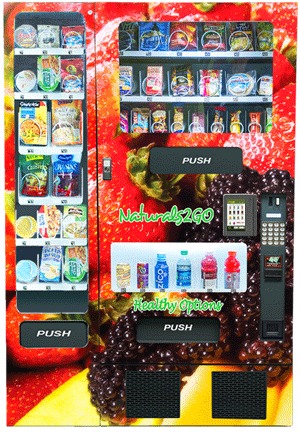 Nutrition2Go offers an extensive selection of healthy snacks and drinks from a single Naturals2Go vending machine. Our vending services company was started for the sole purpose of offering fresh, organic and all-natural snacks and drinks from vending machines. We are not trying to react to the traditional vending industry, we are re-defining it. The Naturals2Go vending machines comply with Americans with Disabilities Act Accessibility Guidelines. Government and Insurance health initiatives and wellness policies are driving businesses, schools and organizations to look for healthy alternatives via vending. Traditional vending companies just cannot compete. Nutrition2Go vending services customizes your product mix with input from your organization, and we develop a Plan-o-gram that replicates the snack and drink mix with recommended retail prices. We adhere to the Fit PickTM nutritional criteria that support a healthy lifestyle.